For very fast (low f/ number) telescopes like the Vixen R200SS or the Takahashi “Epsilon” astrograph, a filter drawer or a filter wheel cannot be used since the distance to the corrector lenses would be changed. With the Astronomik Clip-Filter System you can take care of all of these problems at once! The patented Astronomik Clip-Filter System is black anodized aluminum and laser-cut on state-of-the-art modern machines. It can be inserted within seconds directly into the EOS camera body. There are no changes necessary and all lens functions (focus, screen, image stabilization) remain functional! For Photographers interested in daylight IR-Photography a "MC-modification" is possible for some cameras. If you are interested in this, please send us a short mail. We will give you more details. The "MC-modification" gives you no advantage for normal astrophotography! 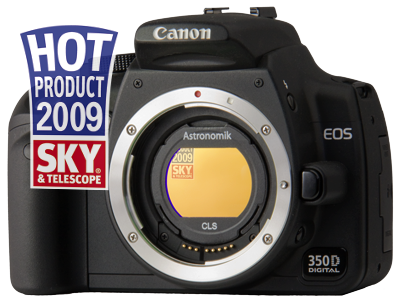 Important: Not suitable are cameras offered before 2003 and all varieties of the Canon EOS 1D and EOS M.
Can I use my existing 1.25 " or 2 " eyepiece filters in the Astronomik EOS Clip-Filter System? This is not possible since the clamp has no threads. The Astronomik Clip-Filter System is only 2mm thick, including the integrated filter, and is therefore not compatible with conventional screw threaded filters. Does the lens autofocus still function with the Astronomik Clip-Filter System installed? Yes, autofocus, exposure measurement, and image stabilization control functions are still useable. The Astronomik Clip-Filter System does not limit any of these functions. How is the Clip-Filter System in the housing of my Canon DSLR fastened? Must I make any camera body modifications? The Astronomik Clip-Filter System can be inserted without any changes to the housing of your Canon DSLR. No tools are necessary  you simply insert or remove with your fingers. When I use the Clip-Filter Systems do I still have to make other modifications to my Canon EOS digital camera for astro-imaging? Specifically, removing the camera’s OEM IR-blocking filter over the sensor? Can I use my regular camera lenses with the Astronomik Clip-Filter System? Yes, you can use all the normal Canon EF bayonet lenses, either Canon OEM or non OEM such as Tamron, Tokina, Wallimex, Sigma, etc.. All lens functions will remain operational. The use of Clip-Filters is NOT possible when using Canon EF-S lenses. I have some the EF-S lenses for APS format sensor cameras. Can I use these together with the Astronomik Clip-Filter System? No. Unfortunately the Clip-Filter System does not function with the EF-S series lenses. The EF-S series lenses extend further into the camera so that it is not possible to fit a filter between the lens and the camera. Can I use the Clip-Filter System with my EOS/T2 and 2 " adapters to the telescope? Yes, that is possible! In this case there are no restrictions. First insert the Clip-Filter into your camera and then install the desired lens adapters. The Clip-Filter fits in such a way that it cannot unintentionally fall out. At the same time, the integrated filter represents an outstanding dust shield for the sensor during long time exposures. I want to take astronomic pictures, but the night sky is bright due to light pollution. How can I improve my results using a DSLR? Is a h-alpha filter a reasonable purchase for my DSLR? In principle, it is. A h-alpha filter provides you many new opportunities: The gain in contrast is extreme and you can expose through the whole night. Unfortunately, the DSLRs are less sensitive at the h-alpha wavelength (656nm) than "real" astronomic CCD Cameras. If your IR-block filter is not removed (or changed), the sensitivity is reduced even more. This ends up in very long exposure times. If you are interested in taking pictures of HII regions, you should think about modifying your DSLR. Is a OIII filter a reasonable purchase for my DSLR? The OIII filter is a reasonable addition to the CLS and H-alpha filter. The advantage of the OIII filter is the high sensitivity at the specific wavelength. If the original IR-block filter is still installed, you need the "normal" OIII filter. If the IR-block filter was removed from your camera, you need the OIII-CCD filter, because this filter has - similar to the CCD-series filter - a build-in IR-block. The IR-block filter is completely removed from my camera. Can I use the ProPlanet-IR-pass filter? Without the original IR-block filter your camera has an appreciable sensitivity. Therefore taking IR-pictures is absolutely possible with the ProPlanet-filters. The IR-block filter is completely removed from my camera. Do I need any special filters? If your IR-block filter is permanent removed or replaced by a MC-clear filter, your camera is highly sensitive in infrared. Therefore you need filters of the Astronomik-CCD-series (h-alpha, OIII-CCD, SII-CCD and h-beta-CCD), because only these filters have a built-in IR-block. The visual filters (UHC, UHC-E, Hß and CLS) are reasonable only with a IR-block filter. I've got a DSLR made by Nikon/Sigma/Pentax. Can I use the clip-filters? No. Unfortunately, the clip-filter system is - due to construction problems - only developed for cameras made by Canon. I have a full-format camera from Canon. Can I use the Clip-Filter-System? If you have any more qustions about the Astronomik Clip-Filter system, feel free to contact us.